3 adjustable front feed knives with bogies and 3 additional smaller sets. 8 feeder belts including 4 drilled belts for suction function. Control panel with touchscreen and buttons for all operations. Independent section that registers the blank to one side ensuring a perfect parallelism before entering the pre-folding or gluing sections. Possibility to register on any side of the machine. Set of accessories for “B” lock bottom. 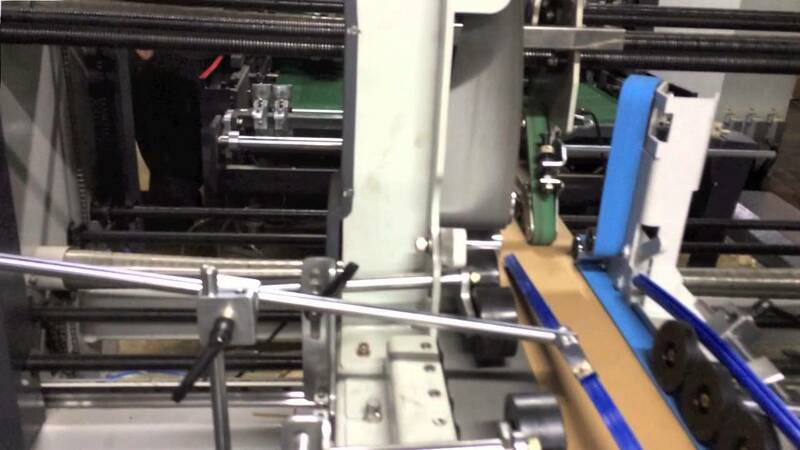 Optional Electronic upper gluing system, cold glue with 3 guns. Other upper gluing system configuration upon request. Outer folding belts adjustable up to 180º with variable speed controlled by two independent servo-motors, L & R side. Three sets of upper & lower carriers with 34 mm upper, 50 mm lower and 100 mm outer belts. Allows a perfect understack or overstack stream of boxes. Continuous and automatic box collection mechanism that ensures a neat transfer to the Press section, guaranteeing an aligned flow. Pneumatic squaring device for accurate closing of crash lock-bottom boxes. Pneumatic squaring device in transfer section. Motorized and pneumatic squaring device on press section. Two carriers with transport belts allow a perfect flow of boxes moving to the pressing station. Rear stack corrector, that allows to square the boxes while falling on the lower conveyor. Independently motorized pneumatic press section. Upper section moves back and forward through a motorized system, allowing different box length. 6.5 meters total length with 4 meters of effective pressure. Motorized and untimed electronic back folding system with intelligent servo-motor technology. Independent scoring section driven by servo motors. Located right after Side-register section, before pre-folding section. Allows to make deeper scores if needed.